1. As determined by the Moldovan Declaration of Independence, which the Constitutional court of Moldova found to take precedence over Article 13 of the Constitution, which uses the name "Moldovan". 2. There is a controversy whether Moldovans and Romanians are the same of different ethnic groups. 3. Proclaimed. Finalized along with the dissolution of the USSR in December 1991. 4. Ranking based on 2009 UN figure. 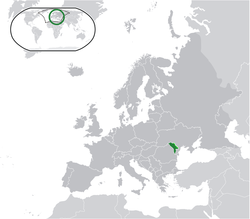 The Republic of Moldova is a country in Eastern Europe. The official language in Moldova is the Romanian language. The capital of Moldova is Chișinău. The Moldova economy's growth is around 7 per-cent, and has the third fastest growing economy of Europe. But in this respect the average monthly salary/wages are still low standing at only $243 USD. Moldova is an associated country for future membership in the EU. ↑ 3.0 3.1 3.2 3.3 "Moldova". International Monetary Fund. http://www.imf.org/external/pubs/ft/weo/2011/02/weodata/weorept.aspx?pr.x=78&pr.y=6&sy=2010&ey=2011&scsm=1&ssd=1&sort=country&ds=.&br=1&c=921&s=NGDPD%2CNGDPDPC%2CPPPGDP%2CPPPPC%2CLP&grp=0&a=. Retrieved 2012-01-30. ↑ "Human Development Report 2011". United Nations. 2011. http://hdr.undp.org/en/media/HDR_2011_EN_Table1.pdf. Retrieved 20 January 2012. ↑ Associated Press (5 December 2013). "Chisinau Recognizes Romanian As Official Language". rferl.org. http://www.rferl.org/content/moldova-romanian-official-language/25191455.html. Retrieved 6 December 2013. This page was last changed on 26 February 2014, at 20:15.